Let us consider how the parties view each other and how well they understand their opponent. An iron curtain works in both directions, giving a distorted impression about what is on the other side. That would seem (seem!) to be more obvious for North Korea, but it is also true for people in the West. Neither Japan nor the United States has diplomatic relations with North Korea, and that significantly limits their ability to collect information. Foreigners are kept under tight control, and therefore information that would be freely available in an ordinary country is very difficult to come by in North Korea. Therefore, Western experts frequently base their conclusions on insufficient information. So the experts are guessing to some extent, and their guesses are largely based on the goals and motivations they ascribe to North Korea’s leaders. 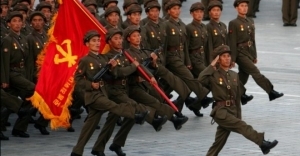 The experts’ guesses are also directly dependent how they perceive North Korea. Having said that, I will proceed to analyze their biases. From the standpoint of the values held in the West and in the United States, collectivist systems like North Korea look like a real Mordor. And since such a system embodies everything that is bad from their point of view, it is unsurprising that if in Mordor they care nothing about prisoners’ children, or if they pour buckets of molten iron on Christian martyrs, it truly is Mordor. There is a presumption of guilt with respect to Mordor, and emotions and an appeal to rescue everyone as quickly as possible take the place of gathering proof. If even a questionable source says Pyongyang has taken all of the disabled children and used them for testing biological weapons, it is accepted as being true until proven otherwise. North Korea’s unpleasant but “realistic” regime has made it into an “Evil Empire” with a well-defined set of features easily understood by the public, and there is a conscious detachment from reality in which myths about a Mordor is created instead of studying the real North Korea. And that increases the likelihood that bad decisions will be made on the basis of false premises. There is a presumption of guilt based not on “legal” grounds (presumption of innocence) but on a “technical” approach that in and of itself is very rational. If an accident can happen, we have to analyze the entire mechanism and make sure everything is working properly. If there is even a 1% chance that there will be an epidemic, we have to do everything we can to isolate someone who may be sick, even if it is a false alarm. Indeed, in an epidemic people who may be infected are quarantined as a preventative measure. If the issue is a suspected terrorist, his bank account can be frozen and his telephone tapped even in the absence of proof in order to prevent him from carrying out an attack in case he really is a terrorist. And if it turns out that he is not a terrorist and would be outraged, it is better to be safe than sorry. The same applies to the new surveillance systems, including satellites, and the rules for inspecting suspicious ships. Whereas previously American warships needed permission from the country where a suspicious ship is flagged, now they can make independent decisions if its flag is hidden or there is clear reason for suspicion. This coin has a dark side. Any simplification of a procedure such as the Patriot Act or other special proceedings (the Soviet Union being no exception) leads to greater efficiency and less red tape on the one hand, and, on the other, it increases the scope for abuse by reducing oversight. It is no wonder that people critical of authority and/or of a conspiratorial mindset perceive such measures as intended only to increase opportunities for abuse. Clearly, this practice is, by and large, flawed — less because it provides room for abuse than because actions based on assumptions take the place of actions based on evidence, and the criteria that make a country a Mordor are very subjective. Suffice it to point out how frequently some of our patriots consider the United States a Mordor because their ideas about America correspond to reality no better than the ideas of some American human rights activists about North Korea. Every improper use of force, which is much more likely when that principle is applied, both corrupts the system of international law and calls its very existence into question, it also sends a signal to others: If the law doesn’t protect you, if you find yourself unjustifiably treated like a witch by inquisitors, the simplest thing to do is to react as harshly as possible. Finally, the list of targets subject to preemption tends to grow in length. First, terrorists are Evil (which seems reasonable), or rogue states are Evil (which seems reasonable to some but destroys the system of international law). Can sexual deviants (in the broad sense of the term) be considered Evil by some criteria and then the unorthodox? What about people opposed to the idea of democracy? Or how about critics of the current government? — and hello, totalitarianism! Unfortunately, I get the feeling that the practice of preventive measures will gradually replace the currently accepted procedure (unless it already has). There are several reasons for that. Second, the growing information· transparency of society increases the theoretical speed of reaction — people respond to heartrending news by demanding immediate action, not a long investigation. After all, if genocide is really happening, every day that assistance is delayed means unnecessary deaths. Third, as time passes many things can· be done more quickly, including terrorist attacks. And we should remember that the Patriot Act has actually facilitated and simplified arrests of real terrorists. We need to keep all of this in mind before going on to the next part, which will examine how the other side looks through the iron curtain.